Since our founding, Delta Upsilon has welcomed men of merit, and merit alone, into our chapters. This is the standard of membership by which we hold accountable both our individual members and our chapters. 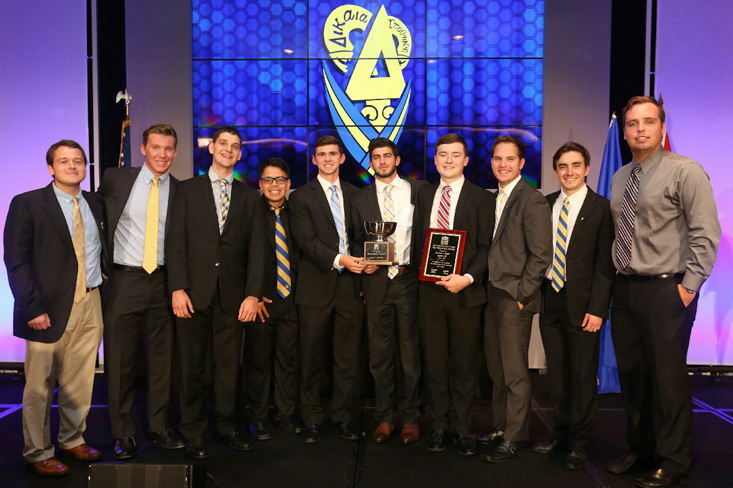 The Delta Upsilon Men of Merit Chapter Standards Program ensures chapters are meeting the expectations of membership in the Fraternity and providing a safe, educational and productive experience for its members. DU seeks to build better men for a global society through service, leadership development, and lifelong personal growth of our diverse membership. 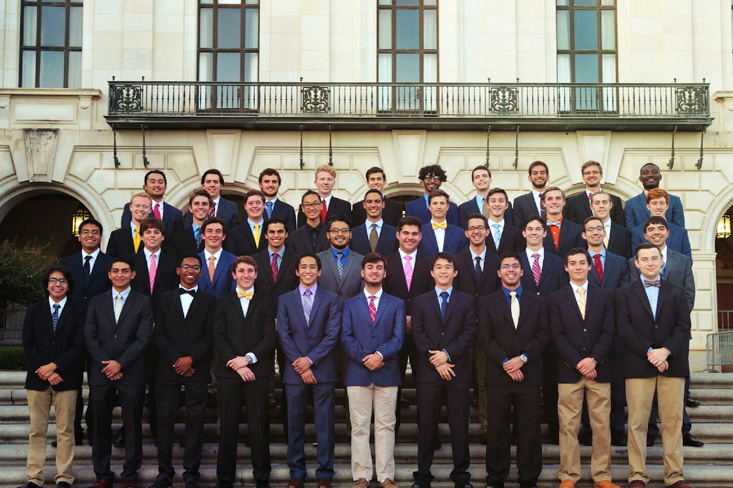 The Men of Merit Program challenges our members and chapters to fulfill the expectations of membership by promoting friendship, developing character, diffusing liberal culture, and advancing justice on a daily basis. The Men of Merit Standards identify 11 key areas essential to success for a Delta Upsilon chapter. Chapters are placed into one of three levels for each Standard based on their performance over the past year: Aspiration, Expectation and Minimum. Click below to download a printable PDF of the Men of Merit Standards. Chapters reaching the Aspiration level achieve above and beyond. These are model Delta Upsilon chapters and they are worthy of the Fraternity's highest honors. Chapters meeting the Expectation level are fulfilling their obligations as a chapter of Delta Upsilon. This is considered a solid level of achievement and one that is attainable by all chapters. Chapters at the Minimum level are on their way to fulfilling the obligations of Delta Upsilon but have improvements to be made. Chapters at this level are placed on an Improvement Plan with additional assistance and focus from the International organization and volunteers. Chapters failing to meet the minimum levels over multiple years may be jeopardy of reorganization or suspension. Chapter's CEP usage is equal to or greater than 90% of all available points. Chapter's CEP usage is equal to or greater than 70% of all available points. Chapter's CEP usage is equal to or greater than 60% of available points. Chapter's GPA is the highest fraternity GPA on campus or exceeds the All-Undergraduate GPA, whichever is lower. Chapter's GPA meets or exceeds the All-Men's or All-Fraternity GPA on campus, whichever is higher. Chapter's GPA meets or exceeds the All-Men's or All-Fraternity GPA on campus, whichever is lower. Chapter has at least 15 members or 15% of the chapter, whichever is higher, attend Delta Upsilon Educational Programs (Leadership Institute, Presidents Academy, Regional Leadership Academy, Emerging Leaders Experience, and the Global Service Initiative) and/or educational programs in which the Delta Upsilon Educational Foundation provides scholarships (LeaderShape, UIFI, etc. 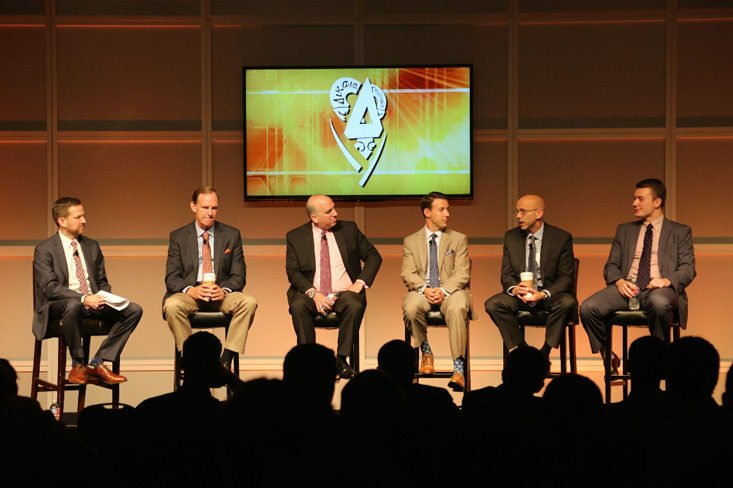 ), including at least eight members at the Leadership Institute. Chapters must utilize all named scholarships through the Delta Upsilon Educational Foundation, if available, to meet this Standard level. Chapter has at least 10 members attend Delta Upsilon Educational Programs (Leadership Institute, Presidents Academy, Regional Leadership Academy, Emerging Leaders Experience, and the Global Service Initiative) and/or educational programs in which the Delta Upsilon Educational Foundation provides scholarships (LeaderShape, UIFI, etc. ), including at least four members at the Leadership Institute. Chapters must utilize all named scholarships through the Delta Upsilon Educational Foundation, if available, to meet this Standard level. Chapter has at least 8 members attend Delta Upsilon Educational Programs (Leadership Institute, Presidents Academy, Regional Leadership Academy, Emerging Leaders Experience, and the Global Service Initiative), including at least two members at the Leadership Institute. Chapters must utilize all named scholarships through the Delta Upsilon Educational Foundation, if available, to meet this Standard level. Chapter supports a local charitable partner, conducts an average of 30 hours of service per member per year, and participates in a Regional GSI Day of Service (if geographically possible). Chapter supports a local charitable partner and conducts an average of 20 hours of service per member per year. Chapter conducts an average of 15 hours of service per member per year. Chapter raises at least $3,000 for the Global Service Initiative. Chapter raises at least $1,000 for the Global Service Initiative. Chapter raises at least $500 for the Global Service Initiative. Chapter's membership size is at least 25% above the campus fraternity average. Chapter's membership size meets or exceeds the campus fraternity average. Chapter's membership size is no more than 10% below the campus fraternity average or 35 members, whichever is higher. Chapter implements the Delta Upsilon Associate Member Education program. Chapter has no Loss Prevention policy violations, and has achieved 50% of available Loss Prevention credits. Chapter has no Loss Prevention policy violations, and has achieved 40% of available Loss Prevention credits. Chapter has a Chapter Advisory Board with a total of eight members, including three who are in weekly contact with chapter leadership, and a separate House Corporation (if applicable). Advisors participate in at least four webinars yearly. Chapter has a Chapter Advisory Board with a total of five members, including one who is in weekly contact with chapter leadership, and a separate House Corporation (if applicable). Advisors participate in at least three webinars yearly. Chapter has a Chapter Advisory Board with a total of three members, including one who is in weekly contact with chapter leadership, and a separate House Corporation (if applicable). Advisors Academy participate in at least two webinars yearly. Chapter has 100% member completion of GreekLifeEdu and 100% member completion of the Delta Upsilon Membership Outcomes Survey. Chapter has 90% member completion of GreekLifeEdu and 90% member completion of the Delta Upsilon Membership Outcomes Survey. Chapter has 80% member completion of GreekLifeEdu and 80% member completion of the Delta Upsilon Membership Outcomes Survey. Note: The member completion of GreekLifeEdu began with all associate members starting in fall 2015, with the assumption that within four years, by spring 2019, all members would have taken GreekLifeEdu as an associate member. In the 2018-2019 evaluation year, “member completion” for GreekLifeEdu will mean 80% + of all chapter members; prior to then it will refer to 80%+ of that year’s associate members. Chapter has no fees past due as of December 15 and May 15. Chapter has no fees more than 30 days past due as of December 15 and May 15. Chapter has no fees more than 45 days past due as of December 15 and May 15 or is current on an agreed-to payment plan. Chapters will be assessed annually at the conclusion of each academic year based on all available data and will be notified of their status by August 1. Each chapter is responsible for submitting its Associate Member Education program verification and service hours per member with documentation and advisor verification via the Delta Upsilon website forms. All other data points are compiled by the International Headquarters. The annual review will place chapters in one of the three levels for each of the 11 Standards: Aspiration, Expectation, and Minimum, with the exception of Associate Member Education, which is at the Expectation level only for complete implementation of the program. Certain Standards carry heavier weight in the evaluation process and not achieving the Expectation level in those Standards may necessitate a meeting with the Men of Merit Committee. The Standards of the CEP, GPA, Program Attendance, Membership, and Accounts Receivable may warrant an automatic meeting. Additionally, chapters noted as Minimum in any combination of four or more Standards will meet with the Men of Merit Committee and may be subject to alcohol-free housing for the duration of the next academic year, as well as a chapter retreat facilitated by International Headquarters staff. Chapters at the Minimum level or below in any Standard are required to follow the noted Improvement Plan. Chapters failing to meet the minimum levels over multiple years may be in jeopardy of reorganization or suspension. On a rotating basis, approximately every three years, each chapter will undergo a comprehensive review of its chapter operations by a Men of Merit Committee, including improvement and achievement with the Chapter Standards. This review will include feedback for both the chapter and the International Headquarters on the effectiveness and impact of the Standards process. Chapters found to be consistently below the Expectation level and showing little to no improvement may be recommend to the Delta Upsilon Board of Directors to examine their ability to continue as a Delta Upsilon chapter. Chapters demonstrating outstanding achievement in the Standards process will be recognized as noted below. If a chapter falls at the Minimum level or below for any chapter Standard, it must begin work on the noted Improvement Plan for that area within the first 30 days of the next academic year (if applicable). The chapter will work collaboratively with its International Headquarters staff liaison and/or Province Governor to ensure successful completion. All chapters meeting the Aspiration and Expectation levels of the Chapter Standards will be recognized annually at the Leadership Institute and in the fall issue of the Quarterly as a "Men of Merit Chapter." Official letters of recognition will be shared with college and university officials. Additional awards and recognition will be conferred based upon individual Chapter Standards performance. The Men of Merit Committee will be comprised of Delta Upsilon staff, alumni and interfraternal colleagues selected based on their expertise and knowledge of chapter operations, as well as industry best practices. They will receive formal training on the Men of Merit program and be charged with assessing chapters on both the annual and rotating timelines as described above. As part of the Men of Merit Chapter Standards Program, all new Delta Upsilon colonies will be established with alcohol-free housing,if applicable. They will remain in alcohol-free housing in perpetuity. Questions about the Men of Merit program can be directed to menofmerit@deltau.org.